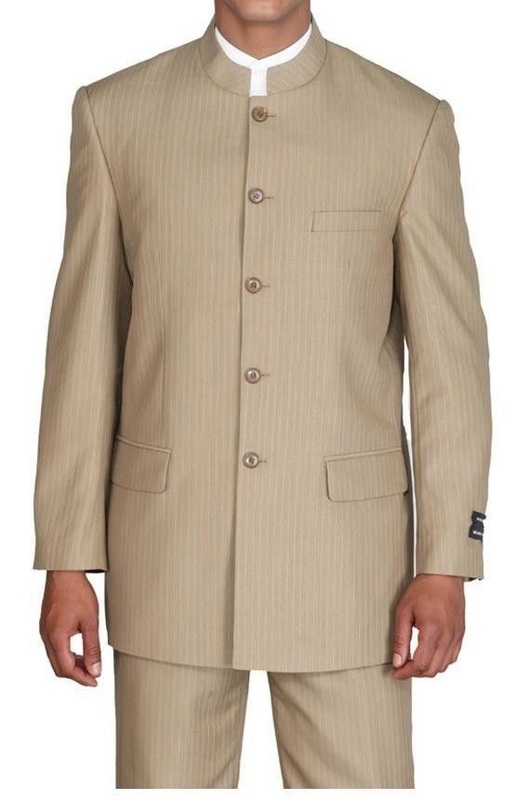 Some men call them Mandarin collar suits or Nehru collar, some folks refer to them as Chinese collar suits and there are even people out there who call them banded collar suits. Whichever way to like to refer to these stylish fashion suits, one thing remains clear as a bell, these Nehru collar suits are packed with attitude and are not the type of suit you would or could ever consider wearing to an office type job and go great with Stacy Adams Shoes. 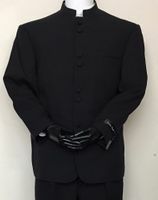 A Chinese collar style suit is by it's very essence a fashion type suit that men with a cutting edge style who favor a uniqueness in their clothing prefer to wear. They are quite different from a Double Breasted Suit. These Mandarin collar suits come in a whole bunch of fashion colors and exhibit a fashionable approach to dress suits that a basic business suit simply doesn't have the tools to muster. Mandarin style or Chinese collar suits are very clean in their looks and can be worn with your basic dress shirt as well as a mock neck or banded collar shirt if wearing tie is just not on your agenda that particular day. 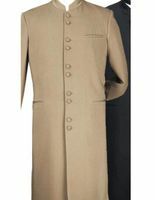 Learn more about Chinese Collar Suits. Chances are you're going to need some new dress shoes as well. Have you seen our Great Selection of Crocodile Shoes and exclusive style Alligator Shoes Here. If it's a fun retro party you're going to, you'll need to see our Zoot Suits for the right look. Try a sparkling Dinner Jacket on for size. Linen Suits for Men are always a great choice for the Summer time.